The sensory experience of walking the streets of Miami’s Little Havana neighborhood is unforgettable. The layered histories, the rich cultural expression, and the colorful architecture underscore the importance of this unique neighborhood. I am proud to say that the National Trust added historic Little Havana to our growing portfolio of National Treasures in January 2017. Not only is the historic neighborhood a new National Treasure but it is also an excellent example of our recent thinking about ReUrbanism. We are very proud to be working alongside strong partners in Little Havana to ensure that it remains thriving, healthy, and livable. 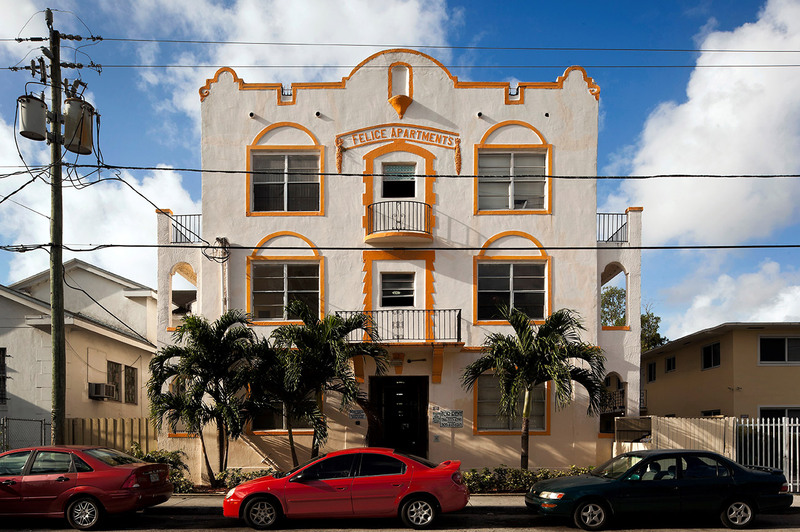 the broad and diverse cohorts of people dedicated to revitalizing Little Havana through building reuse; retrofit; and contextual, human-scale infill. On January 27, we launched the Little Havana National Treasure campaign with a morning press event that included remarks from Miami Mayor Tomás Regalado, City Commissioners Frank Carollo and Francis Suarez, Dade Heritage Trust’s Chris Rupp, PlusUrbia Design’s Juan Mullerat, local developer Bill Fuller, and the National Trust’s President and CEO Stephanie Meeks. The signature metric of the National Trust’s Preservation Green Lab, the Character Score encapsulates three key characteristics of the built environment: the median age of buildings; the diversity, or mix, of old and new buildings; and the granularity, or smallness, of the built fabric. 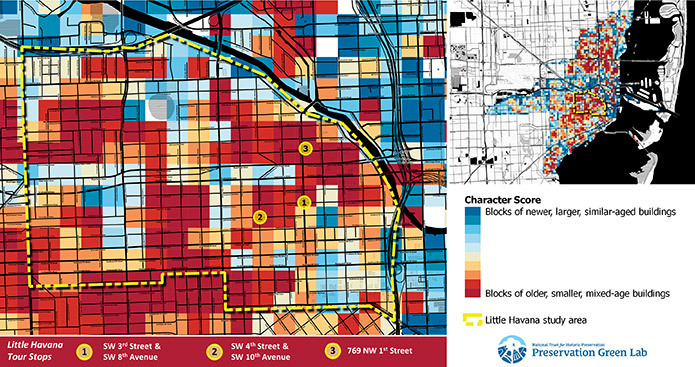 These three metrics were drawn from the seminal ideas of Jane Jacobs, the renowned urbanist and author of “The Death and Life of Great American Cities.” Little Havana has many of Miami’s highest–Character Score blocks (shown in red) where there are concentrations of older, smaller, and mixed-age buildings. On the evening of the announcement, the National Trust and our partners staffed an interactive booth at Viernes Culturales, a monthly cultural festival that draws thousands to Calle Ocho, Little Havana’s cultural tourism hub. At the booth, passersby were invited to fill out notecards indicating what historic places in the community matter most to them. 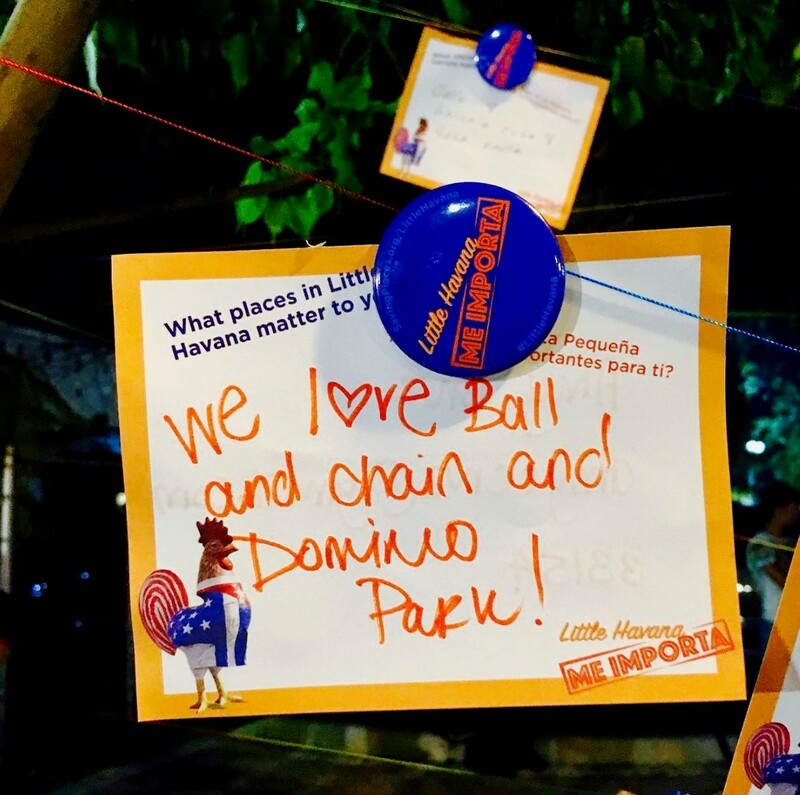 The responses were displayed for all to see, and participants were invited to spin a prize wheel to win Little Havana–themed giveaways. historic—more than 70 percent of its existing built fabric is more than 50 years old. The Preservation Green Lab’s research contributed to both messaging and context setting, in part through the use of maps. Blocks of modest, older, smaller buildings in Little Havana have the same level of population density as the nearby towers of Brickell—but in Little Havana, that density is contained in historic, human-scale buildings. In fact, the densest blocks of Little Havana have more than 40,000 residents per square mile, roughly 2.5 times the average density of San Francisco. 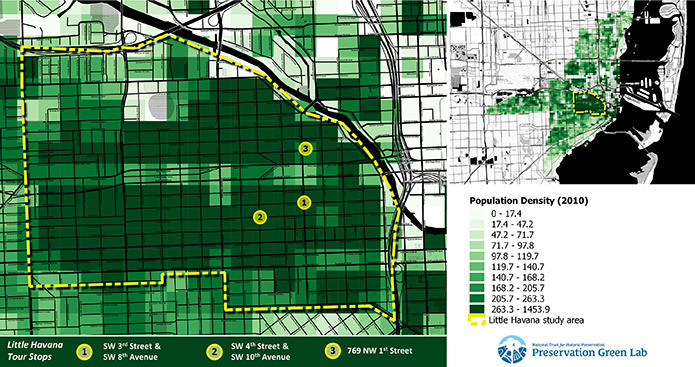 More than half of Miami’s 100 densest blocks are located in Little Havana. 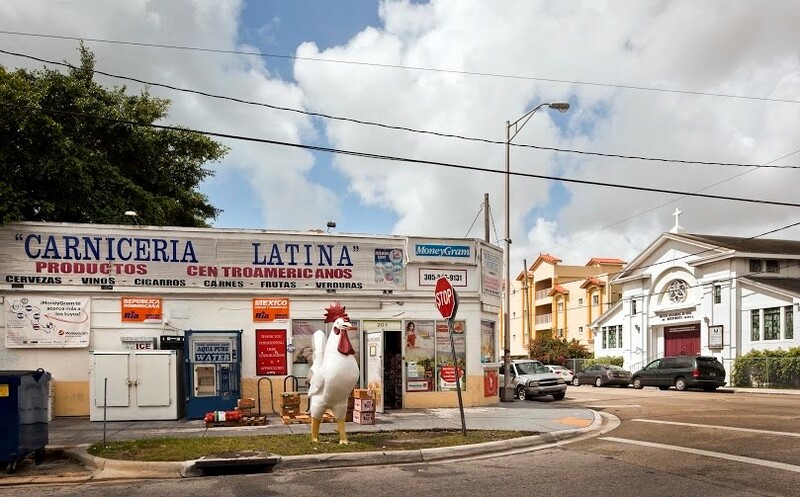 Little Havana is home to immigrants from all over Latin America and the world. It is one of four neighborhoods in Miami where more than 40,000 foreign-born residents live and one of three neighborhoods where more than 70 percent of the population was born abroad. 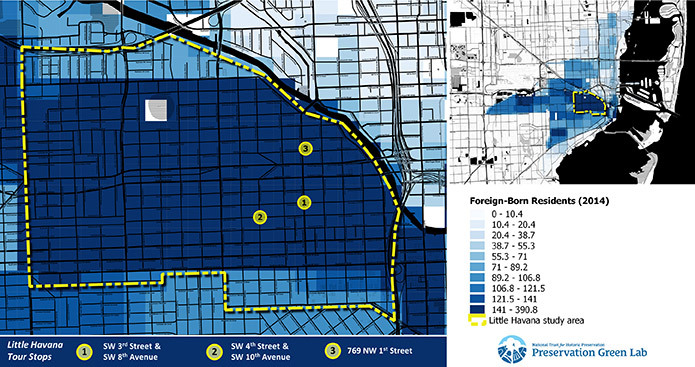 The average block in Little Havana has more than 200 foreign-born residents, which is nearly three times the average density of immigrants citywide. Strike a balance between the reuse of the older building stock and smart, contextual new development. Working with our local partners, we will publish a report and set of recommendations in July 2017. The materials will be available in both English and Spanish, and we will leverage them to inform decision-makers and empower stakeholders. We are looking forward to the next six months. Jeana Wiser is the senior manager of resilient communities at the National Trust’s Preservation Green Lab.